Hi Timo, as an aerial photographer you have made some beautiful images from all over the world; can you tell us how THAW first came about? Having travelled to the Arctic numerous times and seeing the rate of change there, I’ve long wanted to capture the impact of Arctic warming and translate it into beautiful photographs. The Greenland ice sheet has been losing mass rapidly over the past few years and is a major contributor to global sea-level rise – undoubtedly escalated by man’s contribution to global warming. And I really wanted to make the world more aware of what’s going on. 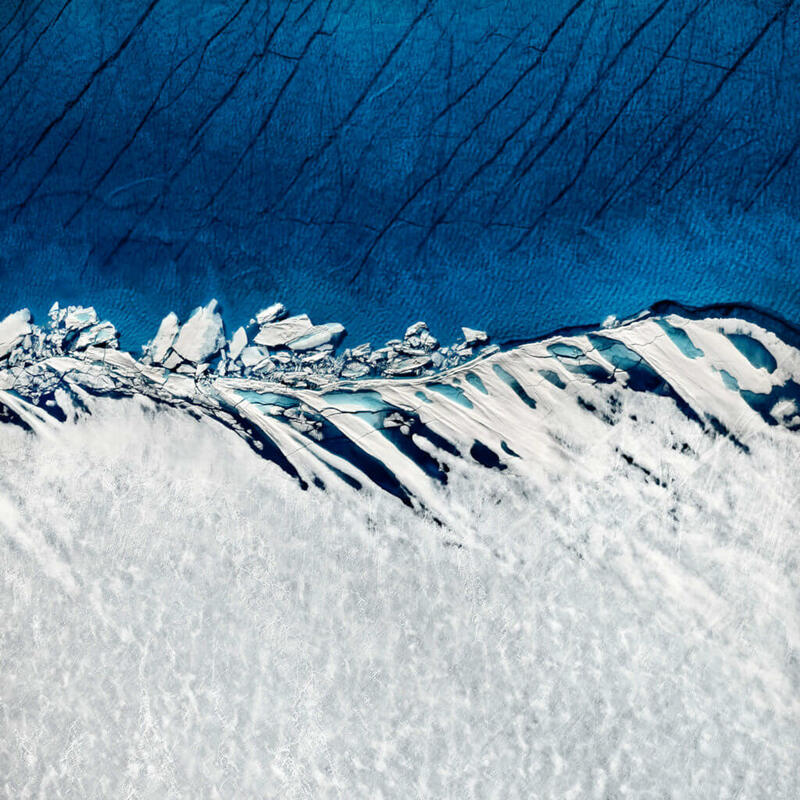 What is important is that THAW is more than just a photographic project – it is a collaboration between fine art photography and the scientific work of several leading glaciologists. Working with Scott Polar Research Institute at the University of Cambridge must have been exciting and a little intimidating. Was it a challenge fitting the creative aspects with the science? Exciting indeed! Generally, I think combining photography and science is incredibly powerful. As an aerial photographer, I can only ever document the status quo (timelapse photography is not really an option), whereas a scientist can provide a longer-term perspective – both in terms of what happened historically and what may happen in the future. 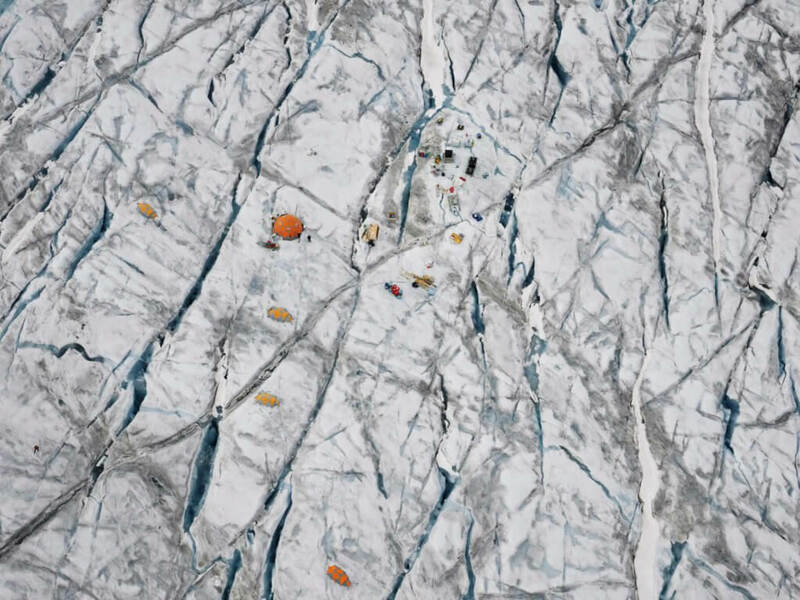 The scientists I teamed up with were Professor Alun Hubbard of Aberystwyth University and Professor Julian Dowdeswell and Dr. Poul Christoffersen at the Scott Polar Research Institute at the University of Cambridge. Alun has worked on several BBC documentaries including Frozen Planet and was incredibly helpful getting the project off to a good start. If you have a common incentive, which is raising awareness of what’s going on in the Arctic, combining the creative aspects with the science is actually not that difficult. Photographing from a moving helicopter in freezing conditions can’t be easy, can you tell us about this? Have you learned any tricks over the years to make it feel more comfortable? Funnily enough, what I found is that my camera gear was incredibly reliable on the ice. When I still used to shoot from the ground at minus 30 Celsius, very often my cable releases would break or my lenses would freeze over from the tiniest bit of moisture in the air. Nothing like this happened with my Phase One camera this time round. What has been the most striking thing you’ve learned from this experience? That despite all the planning you still have to capture the moment. For example, I had studied several satellite maps that the scientists provided in order to find out where the melt lakes were. But often lakes can drain within hours, and where there was a lake just hours ago, you won’t see a thing going forward. More scarily: the second I arrived in Greenland I could have thrown away all my maps as there are so many lakes on the ice cap that you can see them all over the place – no maps required at all. The other experience is that there is a real lack of understanding about the scale and rate of change in the Arctic. In the past two decades, the Greenland ice sheet has shifted from a steady state in balance with its climate, to one in which it is now losing an estimated 380,000,000,000 tonnes of ice annually. That’s a 12 digit figure, and the rate is accelerating. It requires a change in thinking and unfortunately, some people in power seem to be in denial. With such abstract images, what would you hope the viewers will take from your work? We have all heard about climate change but every so often we choose to ignore what may feel like a rather remote problem. Having spent a lot of time with the scientists over the past few months, it really hit me that the Arctic warming is something we can no longer ignore. I felt I needed to do something, if not for my own but for my son’s future. And if more of us start thinking the same, including what we can do to prevent a further melting of the Arctic, then maybe this is a good start. Finally, are there any landscapes you are waiting to visit, what’s next for you?